I was very happy to discover that Volaris flies nonstop from SeaTac to Guadalajara’s Miguel Hidalgo y Costilla International Airport. But next time I come down here, I might just decide it’s worth making a connection. First, many of the announcements at the gate and on the plane were in Spanish only, no English translation. (Safety briefings were in both languages.) Boarding was completely chaotic. It was ostensibly by group, but they pretty much boarded everyone at the same time, and people formed a mob rather than any kind of line. While we were waiting, gate agents came around and randomly tagged rollaboards for gate checking. Then, at the end of the jetway, they offered the option of free baggage check to anyone who wanted it. When I got on board, all the overhead bins were closed. But when I opened the one at my seat, it was empty. And they did not fill up. In spite of the 22 lb. limit for carry‐ons, they did not weigh any bags. The seats were very hard and uncomfortable, and legroom was minimal. I’m 5′9″, and I couldn’t extend my legs under the seat in front of me without banging my shins. There were no adjustable headrests. No entertainment system of any kind. I didn’t partake of any food or beverage service, but as best as I could tell, nothing was complimentary. There are jetways at GDL, but I guess Volaris saves money by not using them. We went down the stairs and onto an actual bus to the terminal. We departed on time and arrived early (just after 5 am) and safely, so I guess I shouldn’t complain. But I wouldn’t recommend Volaris for people taller than I am. If you have an option for a discount Mexican airline, go with Interjet. I flew them to Mexico City last year, and they are much much better. Not knowing anything about Guadalajara before yesterday, I was really taken with the city. I hired a private guide named Ricardo through Tours by Locals. He picked me up at the airport at 8 am, which gave me more than enough time to get through immigration and customs and have breakfast, and I could have done all of that again. Tours by Locals does not use professional guides. They connect you with regular locals who are carefully vetted and love meeting visitors and showing them around. So the tour Ricardo gave me was not canned or polished, but it was personalized to my interests. We drove through some beautiful neighborhoods with houses from the early 20th century that have been transformed into restaurants and other businesses. There were lovely tree‐lined streets. We passed the US consulate, where throngs were gathered, Ricardo said, to apply for visas. We went through several big squares with historical monuments. Our first stop was at Tempio Expiatorio. It’s a great example of neo‐Gothic architecture, complete with heavy stone columns. But the highlight was the carillon, which played at 9 am as 12 figurines representing the apostles paraded across a balcony on the church facade. It was enchanting. After the “concert” we walked around the corner to the Art Museum of the University of Guadalajara. It was closed, but Ricardo convinced the guard at the door to let us in so I could see one of the murals there by José Clemente Orozco. I feel like I should be familiar with Orozco, but the only Mexican muralist I knew about was Diego Rivera. I saw much of Rivera’s work when I was in Mexico City last year, and I admired it quite a lot. But Orozco’s work is far more dramatic, more passionate, darker, and more pessimistic than Rivera’s. And I found it moved me and affected me more deeply than Rivera’s. 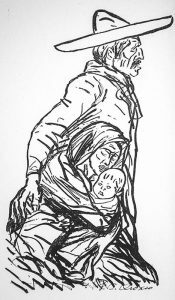 (Upon further research I learned that Orozco did the original illustrations for John Steinbeck’s novel The Pearl. Before the day was over, Ricardo would show me several more Orozco murals, at the Government Palace for the state of Jalisco, and the frescoes in the Instituto Cultural Cabañas, widely considered to be his masterpiece. After Ricardo parked in the historic center, we did quite a bit of walking. The heart of the city is the Cathedral. 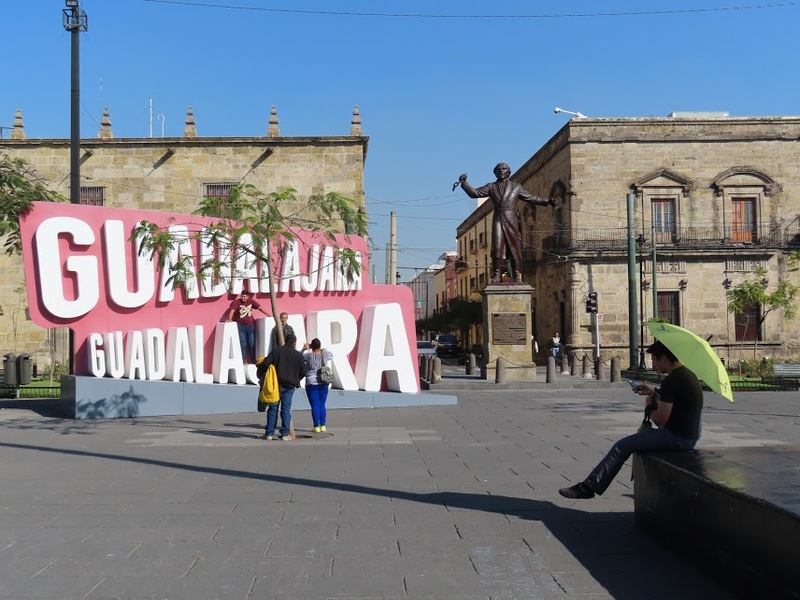 It’s surrounded by four plazas: Plaza Guadalajara, Plaza de Armas, Plaza de la Liberación, and Rotonda de los Jaliscienses Ilustres. This last is a monument honoring famous people from Jalisco. I never heard of any of them—except José Clemente Orozco. I asked Ricardo if there are anyone from Jalisco would be considered world‐famous. He said maybe some soccer stars. Next we went to Tlaquepaque. This is a colorful area of shops and restaurants, popular with locals and tourists. I would have been happy to spend more time here, but I was going on three hours’ sleep, and we still had about an hour drive to get to Ajijic. This is a place I’ll certainly come back to explore more, and I’ll certainly bring visitors here if I move down here and anyone actually comes to visit. Seems like most of the cities have letters. El Parián is a plaza surrounded by restaurants and bars. At night mariachi bands perform and, says Ricardo, the place is packed. In my next post I’ll write about Ajijic. I’ve been here two full days now, so I’m clearly behind in my blogging. I guess I haven’t been as bored as I anticipated.